Giant Foxtail (Setaria faberi) is a monocot weed in the Poaceae family. In Wisconsin this weed first evolved resistance to Group A/1 herbicides in 1991 and infests Carrots, Corn (maize), Onions, and Sweet corn. Group A/1 herbicides are known as ACCase inhibitors (Inhibition of acetyl CoA carboxylase (ACCase)). Research has shown that these particular biotypes are resistant to fluazifop-P-butyl, and sethoxydim and they may be cross-resistant to other Group A/1 herbicides. Grew corn and relied upon alachlor. Now looking at Roundup ready corn. Also using rope wick applicator with glyphosate in carrot. 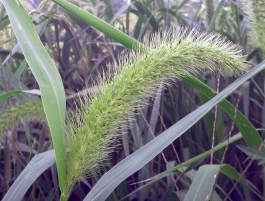 Field, and Greenhouse trials comparing a known susceptible Giant Foxtail biotype with this Giant Foxtail biotype have been used to confirm resistance. For further information on the tests conducted please contact the local weed scientists that provided this information. There is no record of differences in fitness or competitiveness of these resistant biotypes when compared to that of normal susceptible biotypes. If you have any information pertaining to the fitness of Group A/1 resistant Giant Foxtail from Wisconsin please update the database. Richardson, R. J. ; Zandstra, B. H.. 2006. Evaluation of flumioxazin and other herbicides for weed control in gladiolus. Weed Technology 20 : 394 - 398. Two studies were conducted near Bronson, Michigan, USA, to determine gladiolus (Gladiolus sp.) tolerance and weed control with flumioxazin and other herbicide treatments. The first study was conducted in 2002, 2003 and 2004 to evaluate weed control and gladiolus injury with flumioxazin and 14 other pre-emergence treatments. Crop injury over the 3-year period was less than 6% and was considered commercially acceptable with flumioxazin, linuron, oryzalin, pendimethalin, prometryn, S-metolachlor and sulfentrazone. Gladiolus stand count, height, and flower count were similar to those of the nontreated control with these treatments. Clomazone, halosulfuron, imazamox, imazapic, mesotrione, oxyfluorfen, rimsulfuron, and trifloxysulfuron resulted in unacceptable crop injury. Of the acceptable treatments, only flumioxazin controlled (at least 68%) common ragweed (Ambrosia artemisiifolia), yellow nutsedge (Cyperus esculentus) and foxtail species (Setaria faberi and S. viridis var. robusta-purpurea). The second study was conducted in 2003 and 2004. Flumioxazin was evaluated at 4 rates, in mixtures with S-metolachlor and oryzalin, and in comparison with isoxaben plus oryzalin. Gladiolus injury did not exceed 6%. Common ragweed, annual grass (Digitaria sanguinalis and Eragrostis cilianensis), and yellow nutsedge control were at least 63% with all flumioxazin treatments..
Zuver, K. A. ; Bernards, M. L. ; Kells, J. J. ; Sprague, C. L. ; Medlin, C. R. ; Loux, M. M.. 2006. Evaluation of postemergence weed control strategies in herbicide-resistant isolines of corn (Zea mays). Weed Technology 20 : 172 - 178. Herbicide-resistant maize hybrids offer additional options for postemergence (POST) weed control in maize, and growers may benefit from information on the consistency of these weed control strategies. Studies were conducted in Indiana, Illinois, Michigan, and Ohio, USA, in 2000 and 2001, to evaluate weed control among herbicide strategies for imidazolinone-resistant, glufosinate-resistant, glyphosate-resistant, and conventional maize. Isogenic hybrids were utilized to minimize variation in growth and yield potential among hybrids. The glyphosate-resistant maize postemergence (glyphosate-POST) treatment provided more consistent control of giant foxtail (Setaria faberi) than the PRE, conventional maize postemergence (conventional-POST), glufosinate-resistant maize postemergence (glufosinate-POST), and imidazolinone-resistant maize postemergence (imi-POST) treatments. All four POST treatments were more consistent and provided greater control than the PRE treatment of the large-seeded broadleaf weeds such as velvetleaf (Abutilon theophrasti), giant ragweed (Ambrosia trifida), common cocklebur (Xanthium strumarium), and morningglory species (Ipomoea spp.). Conventional-POST and imi-POST were more consistent than glufosinate-POST and glyphosate-POST treatments in controlling giant ragweed. There were no statistical differences in the variability of PRE or POST treatments for control of common lambsquarters (Chenopodium album), common ragweed (Ambrosia artemisiifolia), and redroot pigweed (Amaranthus retroflexus). Maize yield varied among locations and years. The glyphosate-POST treatment did not reduce yield relative to the weed-free treatment, the imi-POST and glufosinate-POST treatments each reduced yield in one of eight locations, and the conventional-POST treatment reduced yield in three of eight locations..
Richardson, R. J. ; Wilson, H. P. ; Armel, G. R. ; Hines, T. E.. 2005. Responses of imidazolinone-resistant corn, several weeds, and two rotational crops to trifloxysulfuron. Weed Technology 19 : 744 - 748. Field and greenhouse studies were conducted in Virginia, USA, in 2000, 2001, and 2002 to evaluate the response of imidazolinone-resistant (IR) maize and selected weeds to trifloxysulfuron applied postemergence (POST). Treatments included a nontreated control and S-metolachlor applied preemergence at 1075 g/ha followed by (fb) trifloxysulfuron POST at 0, 3.8, 7.5, 11.2, and 15 g/ha. IR maize visible injury was less than 6% from field applications of trifloxysulfuron. Visual symptoms were transient, and IR maize yield was not affected by trifloxysulfuron. Common ragweed (Ambrosia artemisiifolia), common lambsquarters (Chenopodium album), annual grass species (giant foxtail (Setaria faberi) and large crabgrass (Digitaria sanguinalis)), and carpetweed ( Mollugo verticillata) were controlled by at least 95% by S-metolachlor fb trifloxysulfuron applications. Morningglory species (ivyleaf morningglory (Ipomoea hederacea [Pharbitis hederacea]), pitted morningglory (Ipomoea lacunosa), and tall morningglory (Ipomoea purpurea [Pharbitis purpurea])) were controlled by at least 97% in 2000 and greater than 77% in 2001 from S-metolachlor fb trifloxysulfuron. Jimsonweed (Datura stramonium) was not adequately controlled. S-metolachlor alone controlled annual grass species 90% but did not control the broadleaf weeds that were present. Wheat was planted following IR maize harvest, and non-IR maize was planted the following spring. No visible response was observed to rotational wheat or non-IR maize crops. Rotational non-IR maize yield was not affected by trifloxysulfuron and was not different from the yield of maize treated with S-metolachlor alone. In greenhouse studies, IR maize was injured 10% at 10 days after treatment with 380 g/ha trifloxysulfuron POST, but recovery was rapid. Based upon results, trifloxysulfuron may be used as an herbicide in IR maize, and rotational wheat and non-IR maize may be planted at normal intervals after cotton harvest..